Last month Orlando Cepeda had to be rushed to the hospital to be treated for a "cardiac incident". Thankfully, according to a SF Gate article the Hall of Fame first baseman has made significant progress towards recovery. The scary news got me to check and I realized that I had not yet dedicated a column to Cepeda. Tonight we rectify this issue. In 1959 Orlando Cepeda made the first of eleven All-Star teams that he would be part of during his 17 year career. 1959 began a four year run that featured two all-star games. Cepeda made all 8 of those teams. Cepeda only appeared in the first of the two 1959 games, with the NL winning the contest 5-4 despite the fact that Cepeda went 0-4. In addition to the 11 ASG Orlando Cepeda's accolades include a World Champion, four postseason appearances, an MVP (1967) award and a Rookie of the Year (1958). And oh yeah that Hall of Fame plaque awarded by the Veterans Committee in 1999. The 1959 Topps All-Star cards close the set and were the last to be released for the year. The nice thing about this is that it allows Topps to put out an All-Star set representing the current years game, unfortunately they made some dubious choices in selection. 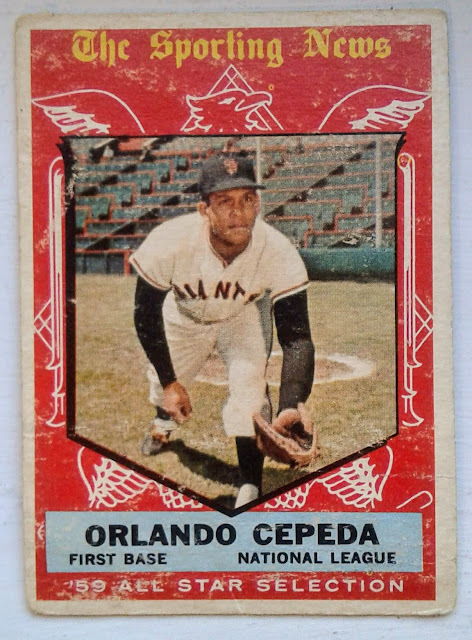 Orlando Cepeda would appear on two other All-Star cards, 1962 and 1968. In addition to being included in the 1968 ASG set Cepeda was also the subject of that years NL All-Star puzzle. I like the backs of the 1959 Topps All-Stars, The full-size cartoon and fun-fact are nicely done. I also like the Bazooka ad at the bottom. 1959 Topps #535 Orlando Cepeda also happens to be a landmark card. I believe 1959 Topps All-Stars are the first subset to include the full-size cartoon. There are actually 2 cards that precede Cepeda in the 1959 ASG Subset, but those are both managers, The first of which is Fred Haney who is the first oversized cartoon back. 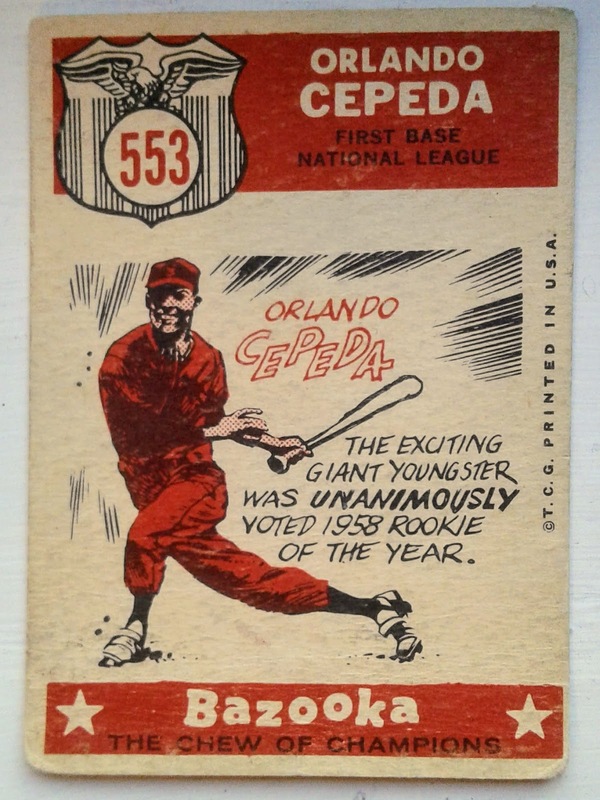 However since he is not a player, and neither is #534 Casey Stengel that makes today's featured guest Orlando Cepeda the first player to have an oversized cartoon back - PIONEER! Thanks to Fuji for getting my wheels rolling in this direction. This is an index of our postings related to the 1959 All-Star Subset. It is the second All-Star set produced by Topps.